As your business grows, processes can become overloaded and inefficient, and when this happens, it’s tempting to ‘fix’ the problem by involving more staff or buying new technology. But that’s only going to make things worse and will cost you more in the long run. To make your processes more efficient, you first need to understand where you currently stand. This is where a Business Process Review (BPR) comes in. A BPR involves analysing the processes used to handle the daily activities of your business in order to identify enhancements and opportunities. How do you know if you need to do a BPR? However, there are factors that prevent BPRs from being successful in SMEs, and it’s important that you’re aware of these before you jump right in. A BPR won’t work without profound cultural change. Decision making in SMEs is often dominated by the CEO, but this can hinder a BPR project, as organisation-wide input is essential. Any improvements to business processes as a result of the BPR involves changes to jobs and the social structure. You’re going to be dealing with people’s reactions to the likely serious organisational changes, so you need to involve them from start to finish to increase motivation, reduce stress and resistance, and improve business performance through employee empowerment. A serious problem SMEs face when starting a BPR project is a lack of financial and human resources. Don’t make the mistake of overlook the costs and people power required for a thorough BPR. Processes affect everyone in the organisation, so a BPR is going to involve everyone too, and this can be a time consuming and expensive exercise. 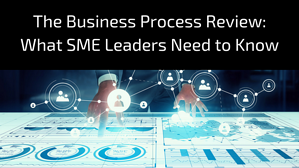 While growth and business performance are the main concerns for SME leaders, financial constraints may inhibit you from undertaking a BPR. The key is to have realistic expectations. This means budgeting and developing estimates of effort. This is a big job in itself – many SMEs will hire a consultant just for this part before the project has even kicked off. Then, once you start working closely with vital staff during the BPR, you’ll be able to better estimate the final implementation costs and the scope of the project. IT infrastructure can be a significant barrier to the options available to planning and changing business processes. Have a good look at your infrastructure, and if needed, consult an IT expert to conduct a business technology assessment. These factors are the difference between success and failure of your BPR, so make sure you’re in the clear before you start your project. The sooner any potential risks to the project can be identified, the greater the chance of successfully mitigating them. Once risks have been identified, they can be better managed. You might also like, What does Business Process Maturity mean for SMEs?